When a piano student is just starting out, it’s important that they have a positive early experience. Moving too fast can be frustrating or overwhelming, but moving too slowly can be dull. The Making Music Fun All-In-One Piano Primer is carefully designed to build young beginners’ skills at just the right pace. 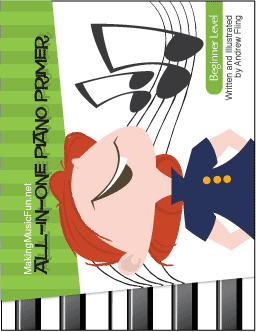 Making Music Fun’s All-In-One Piano Primer is all you need to get new, young students off to a great start. It starts at the very beginning with simple explanation of the most basic concepts, such as the staff, note names, and finger numbers. Several worksheet pages allow students to learn the foundational facts they’ll need to begin playing and review as they go. The music is carefully designed to build in complexity very gradually. The first song uses only one right-hand note so students can focus on rhythm. Additional right-hand notes are added one at a time, and then left-hand notes are added as well. Finally, a few simple left-hand chords are introduced. Songs are short and approachable, keeping young students’ interest. As students work on learning notes, rhythms are limited to three different note values (quarter, half, and whole notes) and two rests (quarter and whole). Rhythm can be one of the most complicated aspects for a new beginner, so keeping this element simple at first builds confidence and mastery. Dynamic markings are limited as well (mp and mf). By the time students receive the certificate at the end of this book, they will have progressed from one-note wonders to two-handed, chord playing pros. What’s more, they will have a firm foundation of knowledge and confidence on which to continue their piano studies. This primer’s careful balance of challenge ad guidance will keep students excited for the next lesson.